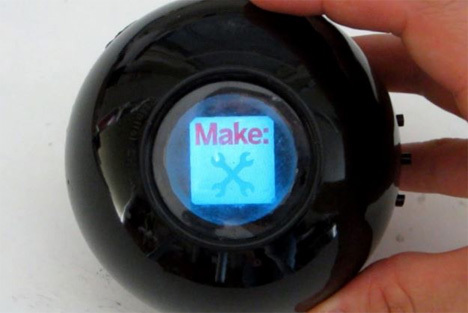 Remember playing with a Magic 8 Ball when you were a kid? You would ask a ‘yes or no’ question, then turn the ball over to see its highly dependable answer floating up through a mysterious blue liquid. It was fun, but there were only 20 possible answers and it got old pretty quickly. DIY-er Jason Poel Smith decided that the toy deserved a 21st century upgrade. 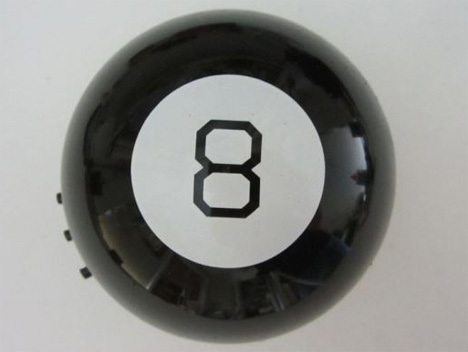 Smith met his goal by cutting apart a Magic 8 Ball, scooping out its innards and replacing them with a small digital picture frame. The frame can hold up to 60 pictures at a time, and what those pictures are is up to the user. You can change them at any time through the handy new USB port created during the project. The project looks easy enough, but it would be kind of a pain to work with all of those little pieces and avoid super-gluing yourself to all of them. If you’ve got more patience than we do, you might have some fun making this digital magic 8-ball and loading up some crazy pictures on the tiny screen. The only drawback seems to be that the digital frame doesn’t have an accelerometer to tell it what position it is in, so it can’t be activated by just flipping the ball over. It will cycle through all of your pictures as a slideshow, and whatever pic happens to be on the screen when you flip the ball over is your answer. See more in Do It Yourself or under Technology. September, 2013.